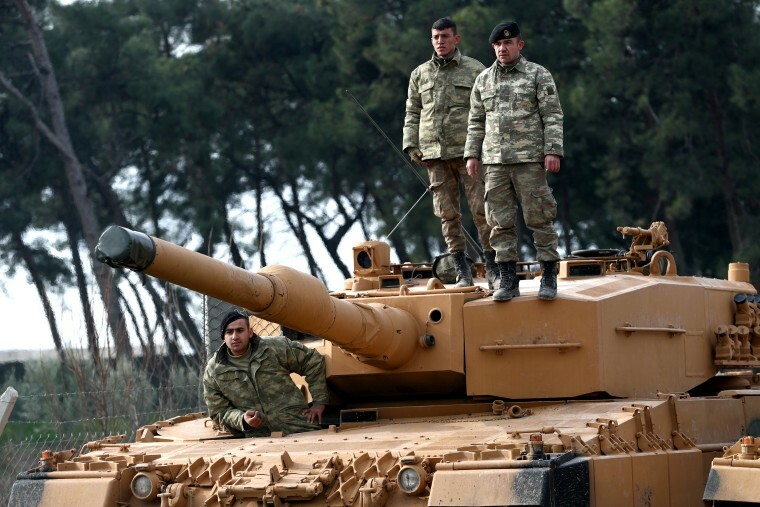 HASSA, Turkey — Turkish troops and Syrian opposition forces attacked a Kurdish enclave in northern Syria on Sunday in their bid to drive a U.S.-allied Kurdish militia from the region. Turkish officials said the troops entered the enclave of Afrin a day after dozens of Turkish jets and Turkish artillery units at the border pounded Syrian Kurdish targets as part of an offensive, codenamed Olive Branch, that came on the heels of sharp threats from Turkey's leaders. Turkey considers the Syrian Kurdish militia, known as the People's Protection Units, or YPG, a terror organization and a security threat because of its affiliation to Kurdish rebels fighting in southeastern Turkey. The group controls Afrin, in Syria's northwestern corner, as well as a swath of territory along Turkey's border. The YPG also forms the backbone of the Syrian Democratic Forces, the main U.S. ally against the Islamic State group in Syria. Turkish President Recep Tayyip Erdogan has promised to expand the operation to other Kurdish regions. Turkish media reports have quoted Prime Minister Binali Yildirim as telling a group of journalists on Sunday that Turkey aims to create a 30-kilometer (20-mile) deep "secure zone" in Afrin. Related: Russia, Iran open their arms as Turkey loses patience with U.S. The state-run Anadolu Agency said the Turkish-backed fighters had penetrated 3 miles into Afrin. Turkish leaders were infuriated by an announcement by the U.S. military this week that it was going to create a 30,000-strong border force with the Kurdish fighters to secure northern Syria. Days later, Secretary of State Rex Tillerson announced that the U.S. would maintain a military presence with the Kurds for the foreseeable future.